EL LIBERAL ESPAÑOL: WHY GREECE WILL NEED A THIRD FINANCIAL PACKAGE? The purpose of this article is to provide information about the agreement between Greece and the Institutions, presenting all the figures of the discussion and look for potential alternatives under the current situation. a) The purpose of the extension is the successful completion of the review on the basis of the conditions in the current arrangement, making best use of the given flexibility which will be considered jointly with the Greek authorities and the institutions. b) This extension would also bridge the time for discussions on a possible follow-up arrangement between the Eurogroup, the institutions and Greece. c) The Greek authorities will present a first list of reform measures, based on the current arrangement, by the end of Monday February 23.
e) In view of the assessment of the institutions the Eurogroup agrees that the funds, so far available in the HFSF buffer, should be held by the EFSF, free of third party rights for the duration of the MFFA extension. The funds continue to be available for the duration of the MFFA extension and can only be used for bank recapitalisation and resolution costs. They will only be released on request by the ECB. (This is around 11bn€). f) The Greek authorities have also committed to ensure the appropriate primary fiscal surpluses or financing proceeds required to guarantee debt sustainability in line with the November 2012 Eurogroup statement. The institutions will, for the 2015 primary surplus target, take the economic circumstances in 2015 into account. The whole Greek public debt is 315.000 million €, the same amount than in 2010 but with a GDP less 25% than 2010 due to the contraction of 25% in last four years, which means 184% of GDP. Between May 2010 and summer 2014, the total amount delivered to Greece was 226.700 million €. In 2010 the first package deal has a value of 110.000 million €. N May 2012 a second package was approved with 153.700 million €. Spain has provided 6.650 million € in cash and 19.000 million € in warranties in both packages. In the second package to be extended if finally there is an agreement, there is available 1.800 million from MEDE and 1.100 million from profits. This is the maximum money could be delivered to Greece in these four months. European Union has provided 195.000 million € and IMF 31.900 million Euro. EU has restructured all loans and debts provided to Greece. These do not represent a big headache for Greece. The tenor of the loans is more than 30 years and interest rates are almost zero. 90% of the money delivered to Greece has been dedicated to payback debts and other financial obligations 200.000 million Euros and hardly 27.000 million Euros for operational needs of Hellenic State. Greece has a primary surplus since 2013, without financial expenses, but every year Greece needs additional money to face payments. EU estimates a goal of 3,5% GDP primary surplus and Greece wants a 1,5% for 2015. In both cases Greece will need additional funds for 2015 and 2016. If EU agrees to 1,5% GDP, it will mean around 3bn€ more or less. a) Next week, 310 Million € to IMF and 1,4 billion€ concerns Treasury bills. b) Next month, additional 930 million € to IMF and 1,6 billion € mature on March 20th requiring a fresh issue. The money for salaries, pension and healthcare is 2,3 bn€. This amount is every month. And Finally 800 million in interests to other creditors. c) April, 600 million € to IMF. e) June, 1,4 bn€ to IMF and 1,2bn € to other creditors. f) July, 5bn€ debt payments including 3,5 bn€ to Eurosystem. (This is not cover by the extension). g) August, other 6.900 million €. h) September 1.400 million € to IMF. i) December 1,4 billion € to IMF. Summarizing, Greece must pay in 2015, 22.500 million Euro. This is the 15% of GDP for 2015. 3. What are the consequences of Tsipras new policy? Supposing that the extension for 4 months is approved, Greece will have to face March and April payments with its own means because nobody expects in EU that the revision will be concluded before April. It means 2.600 million of cash payments to creditors, mainly IMF. The money available in the program hardly covers just June needs. 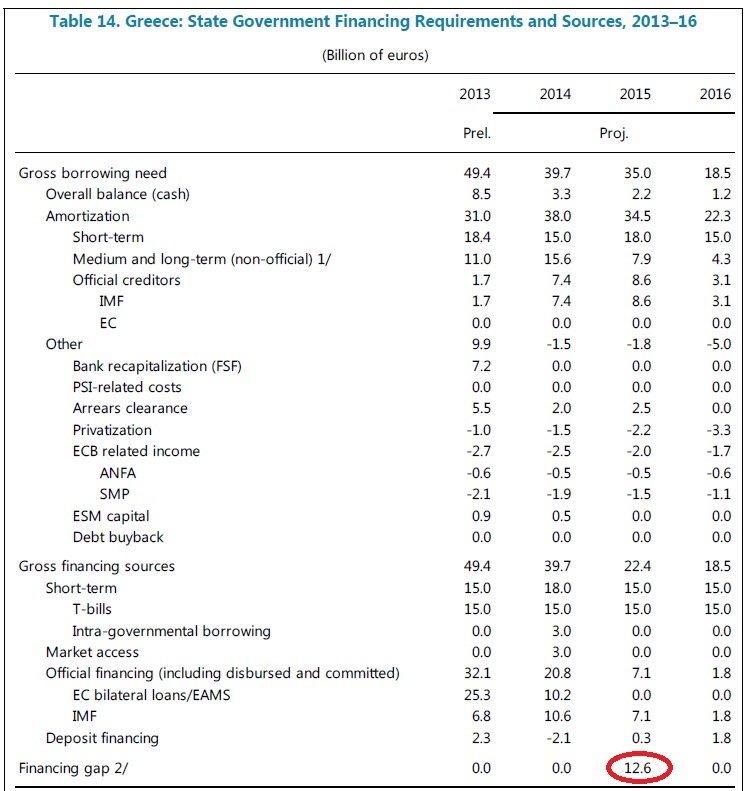 The IMF estimated that Greece’s current bailout was already €12.6bn short. Then if EU provides the 3bn€, the deficit for the programme would be around 9,5 billion Euro, and this amount should be the first chapter of the new financial package. a) The extension of second financial package is not enough for Greece needs during the four months. Greece must allocate own resources to face payments along the extension. b) Loans from EU have a very long tenor and there are not payments until 2020, it means that for and after 2020 Greece will need a primary surplus of 5% of GDP for next ten years. c) The reduction of primary deficit as Tsipras requests, will have a negative impact for the new bailout of 15bn€ in next 3 years. d) Greece will need to have a stable economic growth more than 3% a year to meet financial requirements. If growth is less than this, with a deflation situation, primary surplus must be around 8% GDP. This can be got only with new austerity measures and increasing taxes. If Greece reaches the level of revenues from taxes similar to Spain or Portugal, it could help to reduce the financial needs. e) The forecasts for 2014 and 2015 were optimistic with the highest growth in EU; but if 10% of deposits have flown and there could be a negative impact of the new government´s policy, it will mean that the revision is not positive and the situation could be the worst possible scenario for Greece and Euro. f) The recapitalization of Banks is another chapter, but it seems ECB will support with different mechanisms the liquidity of the system, except revision is not positive. g) If revision is not positive and there is no a new deal, Greece will be technically in default and probably out of Euro.